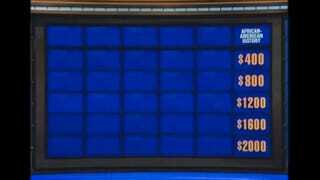 Happy Black History Month, everyone, courtesy of last night's all-white College Jeopardy panel! In the second round of play, the contestants sailed through five of the categories—including "International Cinema Showcase," "Weather Verbs," and "Kiwi Fauna"—but avoided the sixth like the, ahem, black plague. That category was "African-American History."